Jet airplanes have high kinetic energy during the landing roll because of weight and speed. This energy is difficult to dissipate because a jet airplane has low drag with the nose wheel on the ground, and the engines continue to produce forward thrust with the power levers at idle. While wheel brakes normally can cope, there is an obvious need for another speed retarding method. This need is satisfied by the drag provided by reverse thrust. A thrust reverser is a device fitted in the engine exhaust system that effectively reverses the flow of the exhaust gases. The flow does not reverse through 180°; however, the final path of the exhaust gases is about 45° from straight ahead. This, together with the losses in the reverse flow paths, results in a net efficiency of about 50 percent. It produces even less if the engine rpm is less than maximum in reverse. Normally, a jet engine has one of two types of thrust reversers: a target reverser or a cascade reverser. 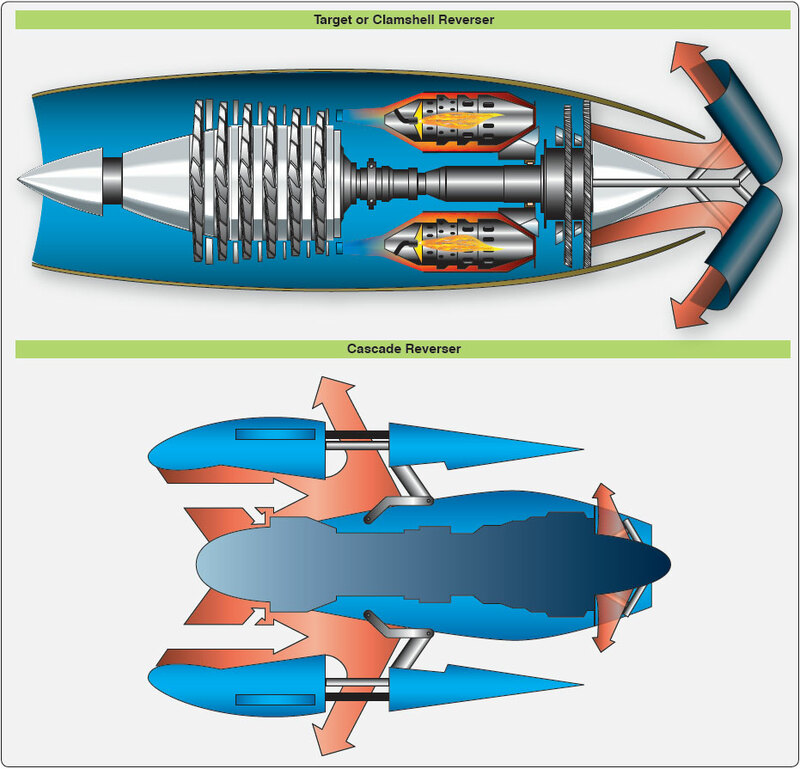 [Figure 15-19] Target reversers are simple clamshell doors that swivel from the stowed position at the engine tailpipe to block all of the outflow and redirect some component of the thrust forward. Cascade reversers are more complex. They are normally found on turbofan engines and are often designed to reverse only the fan air portion. Blocking doors in the shroud obstructs forward fan thrust and redirects it through cascade vanes for some reverse component. Cascades are generally less effective than target reversers, particularly those that reverse only fan air, because they do not affect the engine core, which continues to produce forward thrust. On most installations, reverse thrust is obtained with the thrust lever at idle by pulling up the reverse lever to a detent. Doing so positions the reversing mechanisms for operation but leaves the engine at idle rpm. Further upward and backward movement of the reverse lever increases engine power. Reverse is cancelled by closing the reverse lever to the idle reverse position, then dropping it fully back to the forward idle position. This last movement operates the reverser back to the forward thrust position. Reverse thrust is much more effective at high airplane speed than at low airplane speeds for two reasons: the net amount of reverse thrust increases with speed; and the power produced is higher at higher speeds because of the increased rate of doing work. In other words, the kinetic energy of the airplane is being destroyed at a higher rate at the higher speeds. To get maximum efficiency from reverse thrust, therefore, it should be used as soon as is prudent after touchdown. When considering the proper time to apply reverse thrust after touchdown, the pilot should remember that some airplanes tend to pitch nose up when reverse is selected on landing and this effect, particularly when combined with the nose-up pitch effect from the spoilers, can cause the airplane to leave the ground again momentarily. On these types, the airplane must be firmly on the ground with the nose wheel down before reverse is selected. Other types of airplanes have no change in pitch, and reverse idle may be selected after the main gear is down and before the nose wheel is down. Specific procedures for reverse thrust operation for a particular airplane/engine combination are contained in the FAA-approved AFM for that airplane. There is a significant difference between reverse pitch on a propeller and reverse thrust on a jet. Idle reverse on a propeller produces about 60 percent of the reverse thrust available at full power reverse and is therefore very effective at this setting when full reverse is not needed. On a jet engine, however, selecting idle reverse produces very little actual reverse thrust. In a jet airplane, the pilot must not only select reverse as soon as reasonable, but then must open up to full power reverse as soon as possible. Within AFM limitations, full power reverse should be held until the pilot is certain the landing roll is contained within the distance available. Inadvertent deployment of thrust reversers while airborne is a very serious emergency situation. Therefore, thrust reverser systems are designed with this prospect in mind. The systems normally contain several lock systems: one to keep reversers from operating in the air, another to prevent operation with the thrust levers out of the idle detent, and/or an “auto-stow” circuit to command reverser stowage any time thrust reverser deployment would be inappropriate, such as during takeoff and while airborne. It is essential that pilots understand not only the normal procedures and limitations of thrust reverser use, but also the procedures for coping with uncommanded reverse. Those emergencies demand immediate and accurate response.